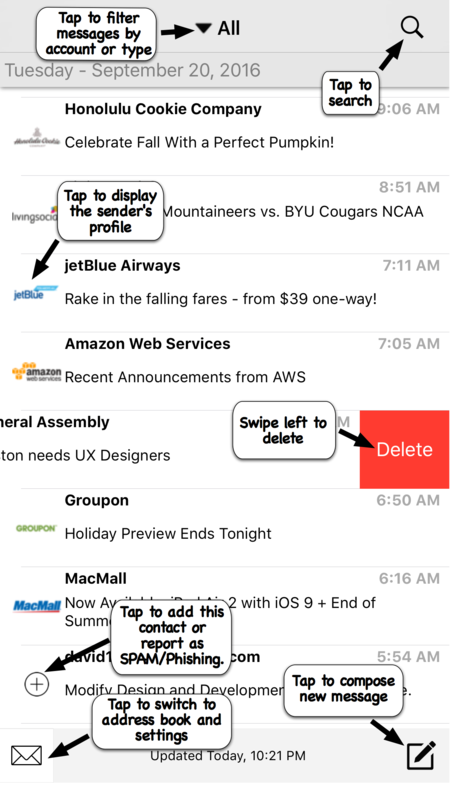 Mailable is the better email app. Designed for mobile. Designed for you. Our app is available on both iPhone and iPad! Download now to get started! Works with all your accounts... Both IMAP and POP3 are supported. You can still run your other email clients in addition to Mailable. You can use your fingerprint to unlock your email. Once unlocked you can freely access it. When you quit the app and reopen it, your fingerprint will be required to view your mail. Of course, you can choose to never lock it. It's all under your control. All your friends, colleagues along with businesses are at your fingertips. Create a list of favorite contacts from your device contacts and our extensive business directory. Email recipients and senders come alive with avatars and profiles. Tap a profile and you can see all the email that you received and sent from that person or business. Select "Hide from timeline" to keep noisy messages on the sender's profile instead of the main timeline. © 2016 OneMsg, LLC. All Rights Reserved.